The Rest of God: Restoring Your Soul by Restoring Sabbath ReviewI can't think of too many books I've enjoyed reading as much as The Rest of God. I am not even talking about the content but just the book. I know nothing about the author, Mark Buchanan, beyond what he reveals within the book. I haven't Googled his name and did not read the fancy little printout the publisher sent along with the book. What I do know is that this guy can write. Publishers Weekly says "His prose is fresh and immediate, earnest and self-effacing at the same time." I couldn't agree more. His prose is poetic. It is a joy to read. But of course the actual writing is only one component of a book and, to be honest, a component that is of lesser importance. Of far more importance is the content. I'm glad to say that, on the whole, I found this a compelling and challenging book. Buchanan argues that as Christians we have lost "the rest of God--the rest God bestows." "In a culture where busyness is a fetish and stillness is laziness, rest is sloth." Our culture expects us to work constantly. But God provides us rest in the Sabbath. "Sabbath is both a day and an attitude to nurture such stillness. It is both a time on the calendar and a disposition of the heart. It is a day we enter, but just as much a way we see. Sabbath imparts the rest of God--the things of God's nature and presence we miss in our busyness." The purpose of this book is "to convince you, in part, that setting apart an entire day, one our of seven, for feasting and resting and worship and play is a gift and not a burden, and neglecting the gift too long will make your soul, like soil never left fallow, hard and dry and spent." He seeks to help Christians understand the importance of developing not just the desire to maintain a Sabbath day but also develop a Sabbath heart. So how do we do this? Well, that is the subject of the book's fourteen chapters. Each chapter concludes with a brief "liturgy," a chance for the reader to practically apply what he has learned. Buchanan begins by setting out a theology of work. He teaches that, because of the fall, some level of discontent with our jobs is inevitable. God made it that way. "In order to keep the Sabbath well--to embrace the rest of God--we need a right view of work. Without a rich theology of labor, we'll have an impoverished theology of rest. We'll find that both are hectic, sporadic, chaotic. We'll find no joy in either." Sabbath is not a day for mere leisure, which is what Sabbath becomes when we no longer know how to santify time. "Leisure is Sabbath bereft of the sacred." Buchanan teaches that there are two Greek words which we translate as "time" in English. The first refers to the time of clock and calendar. This is time in a profane, cold sense. It is the endless, inevitable march of seconds, minutes, hours, days. The second refers to time as an opportunity, as a gift. This is time in the sacred sense, time which has been entrusted to us by God. It is time that must be sanctified on the Sabbath. Sabbath-keeping requires two orientations. One of these is Godward and the other timeward. "To keep Sabbath well--as both a day and an attitude--we have to think clearly about God and freshly about time. We likely, at some level, need to change our minds about both. Unless we trust God's sovereignty, we won't dare risk Sabbath. And unless we receive time as abundance and gift, not as ration and burden, we'll never develop a capacity to savor Sabbath." Our trust in God's sovereignty allows us to take a day in which we cease from all that we need to do and instead focus on feasting, resting, worship and play--those things we rarely make time for on the other six days. So what does Sabbath look like? What can we do on the Sabbath? Buchanan points out that, while God spared no detail in describing Old Testament dietary laws, laws regarding hygiene and laws regarding sacrifices, He provided only a bare outline of Sabbath-keeping. Buchanan does the same. He warns against legalism which, despite its complexity, is mindless, requiring little or no personal engagement. Legalism is "sheer mechanics, simple arithmetic, no more difficult than cranking a hoist or measuring a length of board. You just follow orders." "Sabbath-keeping is grounded in a stark refusal we make to ourselves. We stand ourselves down. We resist that which six days of coming and going, pushing and pulling, dodging and weaving, fighting and defending have bred into us. What we deny ourselves is our well-trained impulses to get and to spend and to make and to master. This day, we go in a direction we're unaccustomed to, unfamiliar with, that the other six days have made seem unnatural to us." If the grass needs to be cut because you did not have a chance to do it on Saturday and you have a busy week approaching, leave the grass. But if the grass needs to be cut and this is one of your favorite, most relaxing chores, than by all means, cut the grass on the Sabbath. The book isn't all good. Buchanan quotes a few of the usual suspects we might expect in a book dealing with this type of subject matter: Henri Nouwen and Brother Lawrence among them. He has a chapter on listening to God which should have been left out as it contributes very little to the book and introduces the flawed concept of prayer as communication from God rather than prayer as communication to God. Some of his biblical interpretation is a mite suspect and I wasn't quite able to figure out his theology of Eucharist or Lord's Supper. But I still found this a tremendously enjoyable book and one that dealt a fresh perspective on an old, old issue. 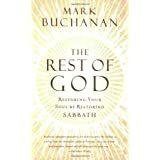 Buchanan paid scant attention to the standard arguments for and against Sabbath, opting instead to show that it is a human necessity and that Sabbath can become a time of unparalleled joy, beauty and rest if only we will slow down long enough to enjoy it. It challenged me and has given me much food for further research and meditation. Want to learn more information about The Rest of God: Restoring Your Soul by Restoring Sabbath?